The JS Kaga at port. Via Wikimedia Commons. Japanese news have confirmed fresh orders of US-made fifth-generation F-35’s in the coming year once the government approves its defense ministry’s annual wish list. Tokyo’s acquisition of multirole stealth fighters was never a secret to begin and the JASDF received its first F-35A’s a few months ago. Japan and South Korea are the only East Asian countries to order the F-35A, a model designed for beyond visual range aerial combat and networked operations. What remains a matter of speculation is how many additional F-35’s is Tokyo allowed to buy. A figure reported by Japanese media reaches 100 but this doesn’t clarify whether these are F-35A’s or vertical takeoff F-35B’s. In early 2018 members of Japan’s defense ministry admitted it was possible for the JMSDF’s “helicopter destroyers” to serve as light aircraft carriers, provided the fixed wing aircraft on them are VTOLs. But with the exception of the AV-8B Harrier there aren’t any VTOLs manufactured anymore, except for the F-35B originally designed to match the US Marine Corps’ requirements. If the JMSDF do adopt VTOLs their only viable choice is the F-35B for both its would-be Izumo-class carriers whose flight decks can accommodate at least 12 fixed wing aircraft each. Once the acquisition of more F-35A/B’s is approved by Washington, DC, their delivery to Japan won’t happen overnight. In fact, it might take several years before the aircraft transform the capabilities of Japan’s combat air fleet, whose mission is overwhelmingly territorial defense. But if Japan manages to reorganize its air force and navy with stealth fighters this gives it a distinct advantage over China, whose own territorial ambitions threatens Japan’s borders. The Chinese PLAAF and PLAN are still modernizing but the adoption of missile-armed long-range bombers, aircraft carrier strike groups, and “fourth-generation” stealth fighters means it’s anticipating war over open seas. Although the formidable J-20 is saddled with inadequate engines, its design and performance characteristics suggests its missions include penetrating air defenses for strikes on sensitive targets. Once J-20 production ramps up in the 2020s (less than 10 are believed to be in service today) the arrival of China’s next-generation strategic bomber and various jet-powered drones seen at the Zhuhai Air Show 2018 can overwhelm the defenses of its nearby adversaries. 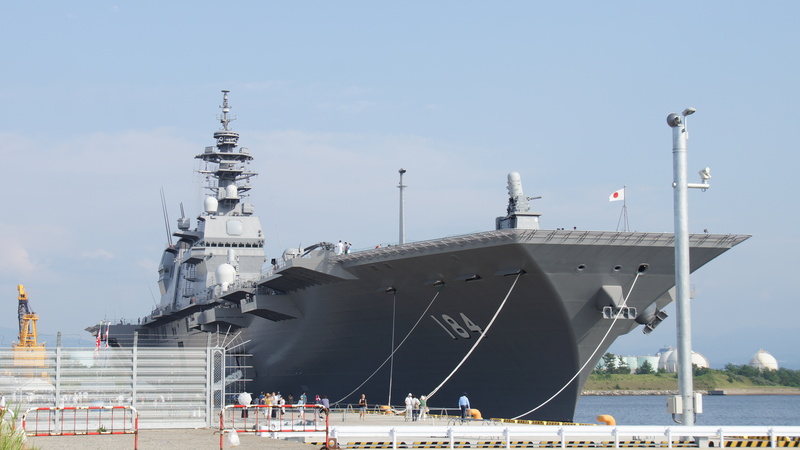 Considering Tokyo’s current efforts to reinforce its anti-ballistic missile defenses and the remote islands it controls, the introduction of genuine aircraft carriers gives the JMSDF striking power it has been missing for decades. In a hypothetical future crisis, an Izumo-class carrier with two dozen F-35B’s can travel to a flashpoint with its own strike group combining at least four destroyers, a replenishment vessel, and two submarines, with anti-submarine aircraft and drones shielding their movements, and either discourage hostilities or neutralize an invasion force. With two, maybe three, of these “carrier strike groups” at its disposal, the JMSDF’s role in the Indo-Pacific Quad is enhanced and a regional war can be averted in the medium-term. This is why ordering a hundred odd F-35A/B’s is gravely serious. Should the deal pull through, the balance of power in East Asia swings to Japan’s favor. At least for a brief moment.